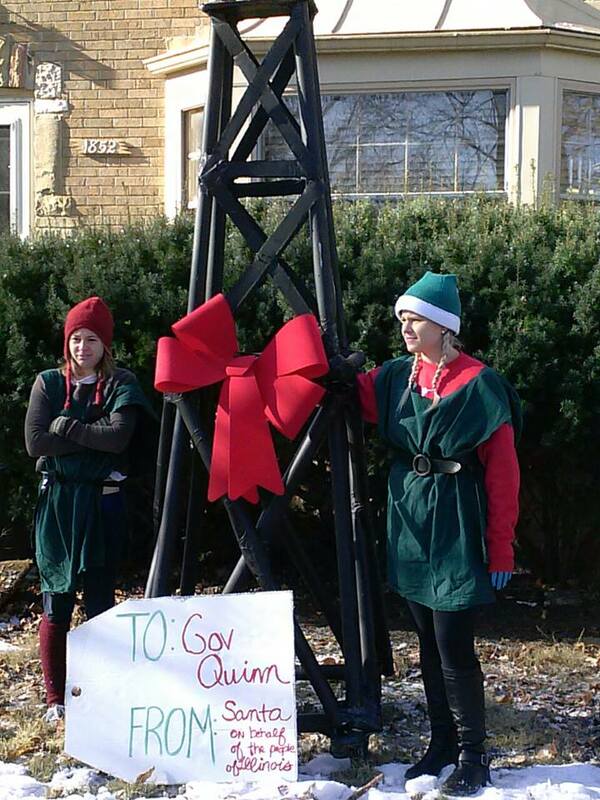 Chicago, IL —Monday morning four concerned community members dressed as elves visited Governor Quinn’s Chicago residence and set up a hydraulic fracturing rig with a large red bow attached on the front lawn. The “elves” said they were delivering a present from Santa who has been nervously watching the dangerous practice of hydraulic fracturing or fracking inch closer and closer to becoming reality in Illinois during the past year. The elves delivered the frack rig because people that live far away from where fracking is planned are the ones making the decision to bring the dangerous practice here. “We are delivering this rig today because if Governor Quinn and the other people that have opened up our state to fracking had to live next to fracking and had to obtain their water from a well I think they would not bring fracking to our state,” said Mike Durshmid of Rising Tide Chicago. Hydraulic fracturing is an environmentally damaging practice in which large amounts of water, sand and chemicals are combined and then forced deep underground to break shale rock to release trapped oil and gas. Fracking has been linked to earthquakes and air and water pollution in Colorado, Ohio, Texas and Pennsylvania, states that have been using the practice for some time. The climate implications of fracking were front and center during the delivery as the elves spoke about how their home, the north pole had been irreversibly damaged due the loss of ice. They also drew the connection to climate related disaster like Hurricane Sandy and the extreme drought that Southern Illinois experienced a few years ago and how these events would become more frequent and intense if we continue to emit more greenhouse gases like the methane that is released during hydraulic fracturing. “We just can’t afford to allow the expansion of fossil fuel infrastructure, and must find a way to live that does not put continued economic growth above preserving a habitable planet. For this reason we must stop fracking from starting in Illinois and also work to make larger systematic changes” said Angie Viands of Rising Tide Chicago. The frack rig delivery, organized by Rising Tide Chicago, comes on the heals of several public hearings on hydraulic fracturing in the state that drew at least a thousand residents expressing their concerns about the practice and some vowing to resist it if it comes to Illinois.